There are over 100 companies out there developing small VTOL "flying cars." And they're all making different decisions on several important design choices. I've written a breakdown of the key design decisions and what they mean, which forms a sort of taxonomy. Readers all know I love robocars and write about the tremendous effect they will have on our lives and cities. But a new technology, running about a decade behind but now real, is coming which could have even more dramatic effects, the e-VTOL or "flying car." Where's a fireproof rescue vehicle? 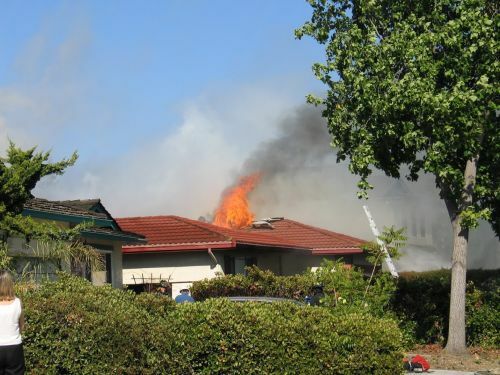 Everybody here is in shock over the destruction and death from the recent California fires, and I, like many, have even fled the coast for the mountains as the air in the San Francisco Bay area remains unsafe. Videos of people escaping down burning streets send chills into those who watch them. Read more about Where's a fireproof rescue vehicle? Tons of new ideas in aviation. Will regulation stop them? 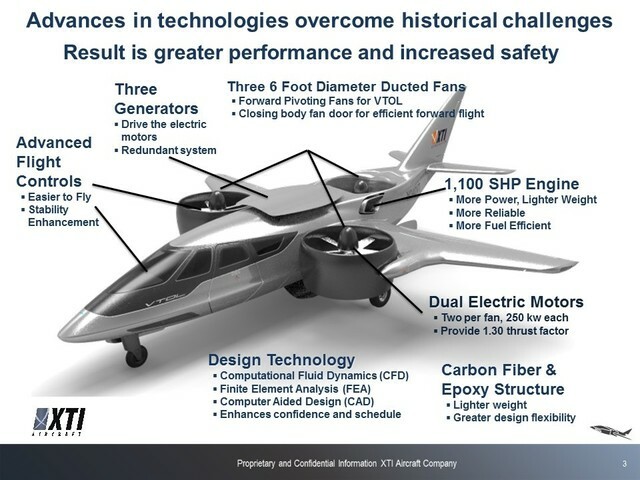 This week I attended the "Revolution.Aero" conference on advanced new ideas in aviation, including electric VTOL aircraft (often called "flying cars.") I learned that there's a lot of interesting new stuff going on in aviation, but the strong regulatory environment keeps much of it repressed. Read more about Tons of new ideas in aviation. Will regulation stop them? Opener's "Blackfly" VTOL aircraft is happy to land on grass or water. 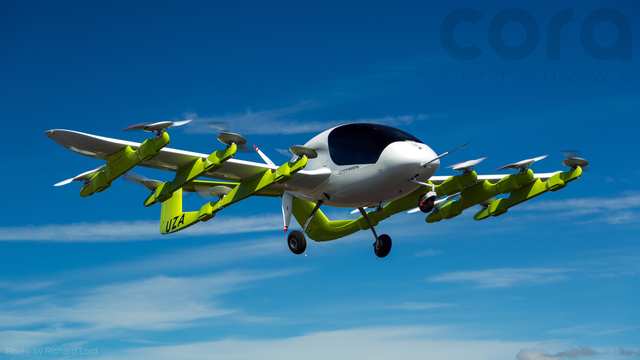 In the world of flying cars, another big step was taken with the partial unveiling of the Kitty Hawk Cora. Kitty Hawk is a project involving some friends of mine who made the Google car project happen, and while it's very nascent it could have some big effects. 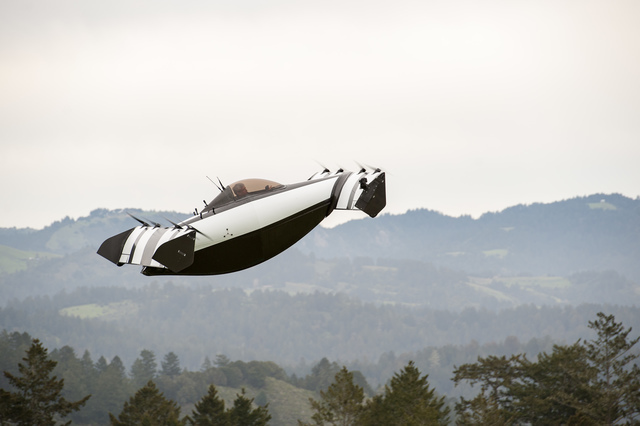 Autonomous flying personal transportation -- "the flying car" -- is becoming real. I have written previously about some of the issues such as noise, energy efficiency and "sky pollution" but it's clear that the engineering problems are being solved. Solving those other problems is a challenge, but I can be more confident in predicting that in the 2020s, many ambulances, police, fire and military vehicles will be based on multirotor technology. This will be particularly true in more rural areas or areas with limited roads. 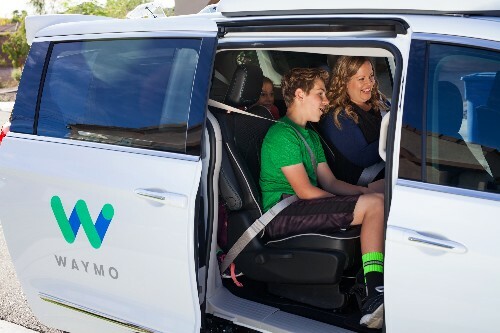 Waymo (Google) has announced a pilot project in Phoenix offering a full ride service, with daily use, in their new minivans. Members of the public can sign up -- the link is sure to be overwhelmed with applicants, but it has videos and more details -- and some families are already participating. There's also a Waymo Blog post. I was in Phoenix this morning as it turns out, but to tell real estate developers about robocars, not for this. They are attempting to cover a large area -- they claim twice the size of San Francisco, or 90 square miles. That's a lot. It's enough to cover the vast majority of trips for some pilot users. In other words, this is the first pilot which can test what it's like to offer a "car replacement." In the videos, they are acting like there are no safety drivers, but there surely are, for legal reasons as well as safety. They are using the Pacifia minivans. The Firefly bubble cars are too slow for anything but neighbourhood operation. The minivans feature motorized doors, a feature which, though minor and commonplace, meets the image of what you want from a self-driving car. There has been much speculation recently because of some departures from Apple's car team that they had given up. In fact, last week they applied for self-driving car test plates for California. I never thought they had left the game. The recently released national noise map makes it strikingly clear just how much air travel contributes to the noise pollution in our lives. In my previous discussion of flying cars I expressed the feeling that the noise of flying cars is one of their greatest challenges. Flying cars are coming, what will they mean? 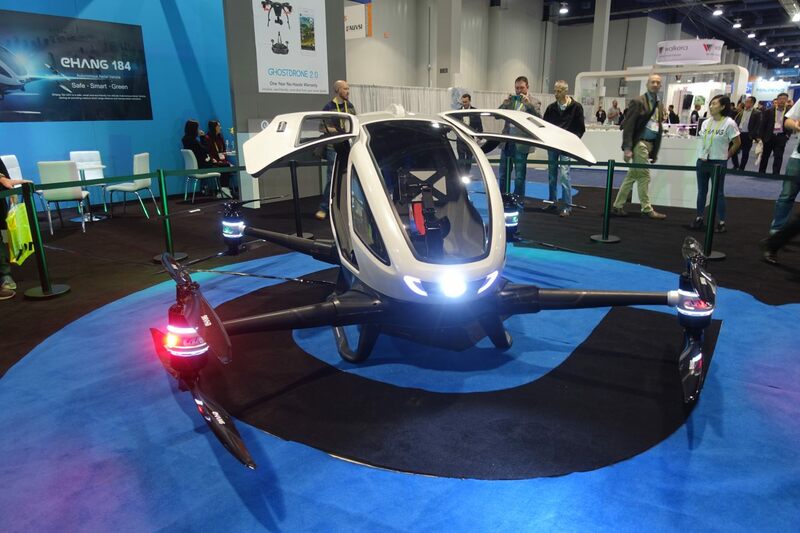 Earlier I posted my gallery of CES gadgets, and included a photo of the eHang 184 from China, a "personal drone" able, in theory, to carry a person up to 100kg. Whether the eHang is real or not, some version of the personal automated flying vehicle is coming, and it's not that far away. 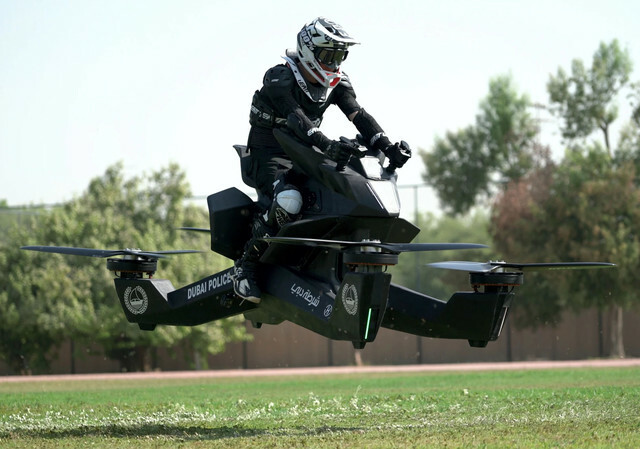 When I talk about robocars, I am often asked "what about flying cars?" and there will indeed be competition between them. There are a variety of factors that will affect that competition, and many other social effects not yet much discussed. There are two visions of the flying car. The most common is VTOL -- vertical takeoff and landing -- something that may have no wheels at all because it's more a helicopter than a car or airplane. The recent revolution in automation and stability for multirotor helicopters -- better known as drones -- is making people wonder when we'll get one able to carry a person. Multirotors almost exclusively use electric motors because you must adjust speed very quickly to get stability and control. You also want the redundancy of multiple motors and power systems, so you can lose a rotor or a battery and still fly. This creates a problem because electric batteries are heavy. It takes a lot of power to fly this way. Carrying more batteries means more weight -- and thus more power needed to carry the batteries. There are diminishing returns, and you can't get much speed, power or range before the batteries are dead. OK in a 3 kilo drone, not OK in a 150 kilo one. Lots of people are experimenting with combining multirotor for takeoff and landing, and traditional "fixed wing" (standard airplane) designs to travel any distance. This is a great deal more efficient, but even so, still a challenge to do with batteries for long distance flight. Other ideas including using liquid fuels some way. Those include just using a regular liquid fuel motor to run a generator (not very efficient) or combining direct drive of a master propeller with fine-control electric drive of smaller propellers for the dynamic control needed. Another interesting option is the autogyro, which looks like a helicopter but needs a small runway for takeoff. Some "flying car" efforts have made airplanes whose wings fold up so they can drive on the road. These have never "taken off" -- they usually end up a compromise that is not a very good car or a very good plane. They need airports but you can keep driving from the airport. They are not, for now, autonomous. Some want to fly most of their miles, and drive just short distances. Some other designs are mostly for driving, but have an ability to "short hop" via parasailing or autogyro flying when desired. Read more about Flying cars are coming, what will they mean?